After a year’s hiatus, a cherished tradition returns to the 31st annual Philippine International Aid – Giving Hope to the Children 2017 charity luncheon. Style and elegance will be back in spades as the highlight of this year’s event will be the fashion show by Oliver Tolentino. The luncheon will be held on November 19, 2017 at its traditional site, the Hyatt Regency Embarcadero in San Francisco. Tolentino is best known for his soft, elegant and understated lines that bring out the feminine figure. He is a leading Manila and Beverly Hills-based designer. Shown here are samples of Oliver’s work and designs. A very classic, orange-sherbet silk chiffon gown with hand-beaded bodice and cap sleeves. Very soft, very feminine lines. Tolentino originally hails from Orani, Bataan province, a few hours outside Manila. Even at an early age, Oliver was already drawn to designing couture. But his mother also cautioned him first to build a more traditional foundation on which to fall back, should his fashion dreams not work out. So, Oliver first took up advertising at Miriam College. There, he still ended up designing and putting together outfits for his more “well-to-do” classmates and for larger events like Glee Club performances. But Oliver could not be stopped from his true calling. So, he enrolled at the top two fashion specialty schools in the Philippines -- Slims School of Fashion Design and the Philippine Fashion Institute. He then set up shop at Valle Verde in Pasig, then at San Lorenzo Village in Makati, and he was on his way. Finally, Oliver built a growing reputation not only among his Manila clientele, but he also had come to attract a great number of Fil-Am balikbayans. Such was Oliver’s popularity with US-West Coast expat Filipinos that in 2009, he took the leap and opened up a shop in Los Angeles. Lush, classic and romantic are hallmarks of Tolentino’s haute couture designs. For Ana Maria Perez de Tagle, Sylvia la Torre’s granddaughter. Actress Rachel Leigh Cook in a perfectly simple but classic aqua OT gownat the 2013 People’s Choice Award Show. Oliver with former LA prosecutor, Marcia Clark, of O.J. Simpson trial fame. Oliver is wearing his own custom-design tuxedo and Ms. Clark is in an evening gown designed by him. This was at the 2016 Primetime Emmy Awards show. For Miss Philippines/Universe 2015 Pia Wurtzbach, the above red gown was a last-minute choice for the preliminary Evening Gown portion (which the home-viewing audience does not get to see. It is from that section that first cut of 15 finalists are picked by the Miss Universe staff.) Wurtzbach was not happy with the gowns sent by Binibining Pilipinas in Manila, so her team hurriedly reached out to Tolentino. He came to the rescue, sending her eleven outfits to Las Vegas for her to choose from. 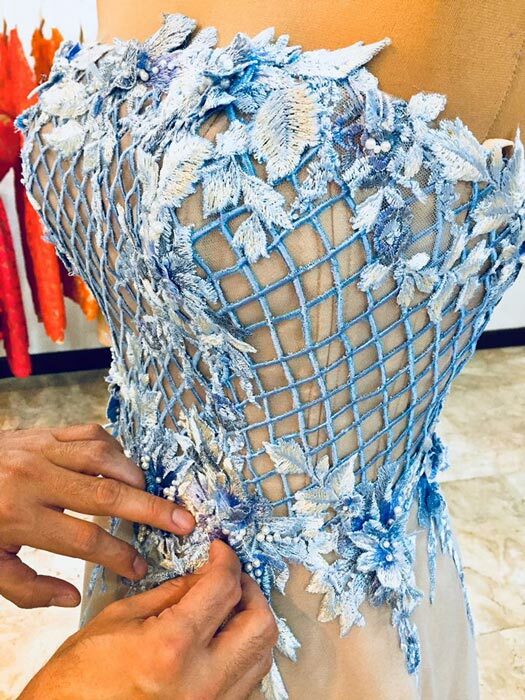 Even though Tolentino, like some Filipino designers based in the Middle East, have set their sights on the global market outside the Philippines, he nonetheless always harks back to his roots. 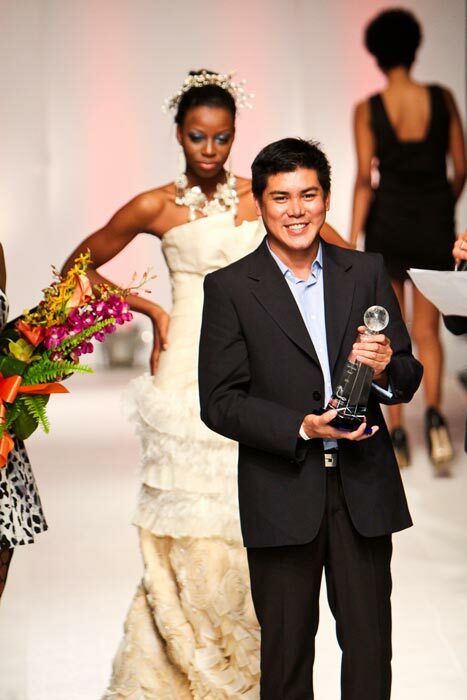 As such, like the “Beauty with a Purpose” mantra (espoused by the Miss World pageant), Tolentino likes to stress that he uses sustainable eco-friendly materials and processes –piña, abaca plant fibers, jute (hemp), water lily leaves and, to a certain very limited and infant-stage industry, raw silk cocoon, in his designs and creations when he can. By doing so, the piña and abaca plant fiber-weavers of Lumban, Laguna, are never far from Tolentino’s thoughts. One cannot survive on haute couture alone, thus Tolentino has also moved into the more commercial aspects of the business – pret-a-porter and a men’s line. It is, after all, still a business, and a staff and payroll have to be maintained, the looms in Laguna kept running, not to mention overhead and advertising. Pret-a-porter means ready-to-wear day outfits for today’s busy lifestyle. Those run a few hundred dollars. The men’s jacket line, starting with beautiful, unique, one-of-a-kind, dinner jackets, is made of the highest quality silk material—gotta keep those little worms in China and Thailand busy—custom-fit and runs around $1,000 each. Above all, for his haute couture designs, Tolentino sticks to classic, unfussy lines—no bizarre, outrageous, lampshade-on-a-high motifs that anyone apart from an anorexic model voguing on the runway would wear—just basic, beautiful, understated, classic designs that any time a woman puts on a Tolentino gown, she feels good wearing it and being seen. Again, supremely feminine wedding gowns by OT. I asked him -- opera? stage design? The designer said he would like to move on to designing his own fashion accessories, i.e., hand/evening bags and shoes. Watch out, Michael Kors, Manolo and Ivanka! Finally, Tolentino has prepared a large, special show for the PIA event. There will be some sixty (count ’em, 60) new and original ensembles which Tolentino has prepared exclusively for the event. Myles’ two other books are: Secrets of the Olympic Ceremonies (latest edition, 2016); and Thirty Years Later . . . Catching Up with the Marcos-Era Crimes published last year, also available from amazon.com.